In the modern international tax world, tax advisors may assist their clients in using tax treaties in a manner clearly contrary to the treaties intent. With the right guidance, investors can determine which treaties offer the most beneficial access to the company of the desired investment. Investors have been known to go so far as to quickly set up corporations in countries with no connection to themselves or to the target country, simply to take advantage of a particular treaty network. 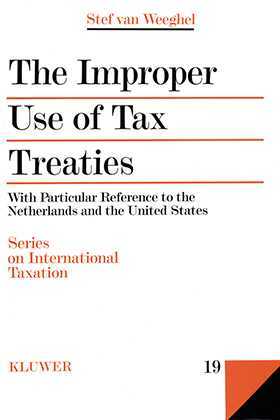 In response, governments have sought means to curb these and other `improper' tax treaty practices. a look into the phenomenon of treaty shopping, other perceived improper uses of tax treaties, and the efforts to combat this, including interpretation and application of substance over form principles and domestic legislation and treaty provisions, in particular limitation on benefit provisions. The Improper Use of Tax Treaties will assist advisors in understanding the limits on improper practices. Its historical examination and look at policy will also interest and inform academics and policymakers.